Remember this post back here when I talked about how much fruit I had jammed into my new fridge? 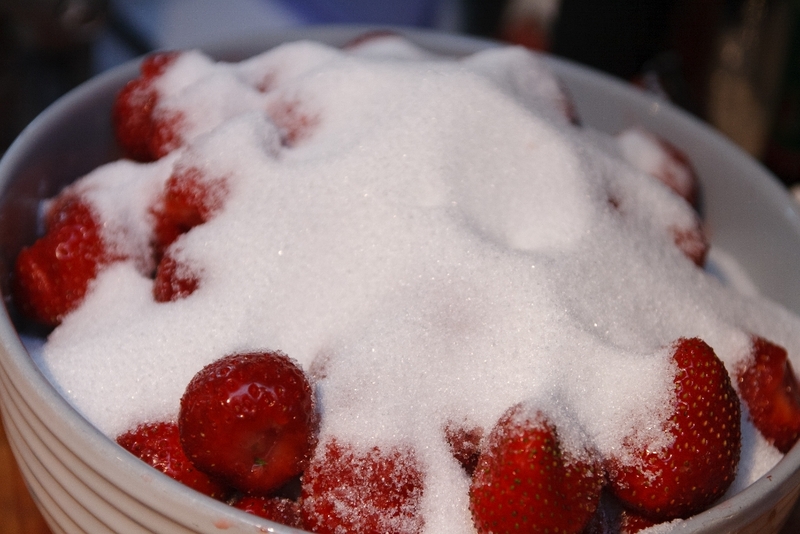 Well, as it turns out, we didn't really ever get around to finishing off the strawberries. So Camille whipped them into this super quick and easy freezer jam while she was here. Her batch was so quickly eaten that I ran to the farmer's market to get a big basket of strawberries to make more, before they are out of season. At the same time, I also whipped up a batch of blueberry vanilla chia seed jam from Oh She Glows. And then made some blueberry oatmeal squares with that, for my parents' visit this weekend. 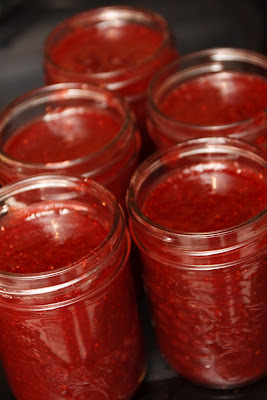 I used to make various freezer and regular jams, but find that this one, which has no pectin or other preservatives, has a much stronger fruit flavour than any others I've made. You basically just pick whatever fruit you want to make jam with, weigh it and then add half of the fruit's weight in sugar. 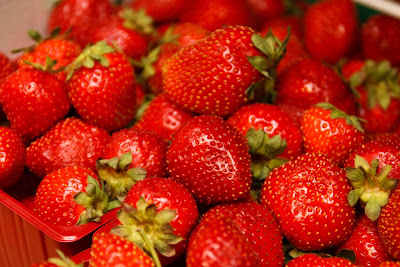 Pour the sugar over the fruit and let sit overnight in the fridge, so that the fruit will release its juices. now that's a mountain of sugar!! 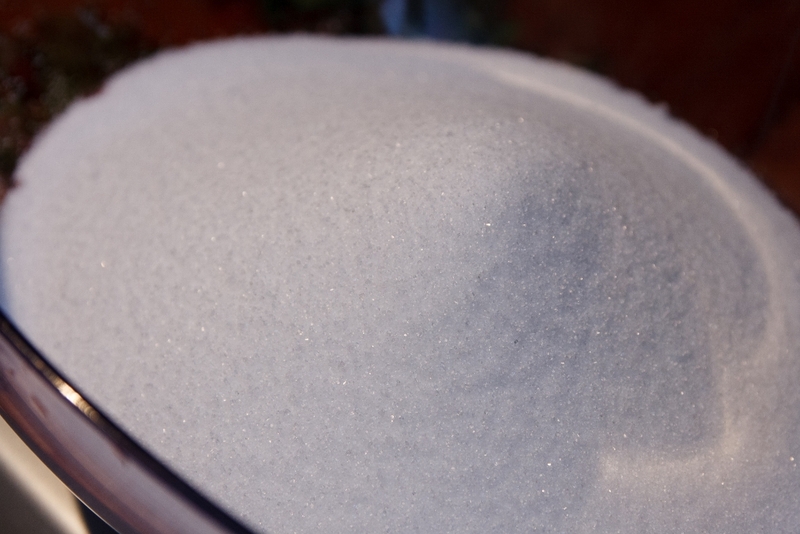 Next day, put the fruit/sugar mixture into a big pot and cook over low-medium heat until cooked. 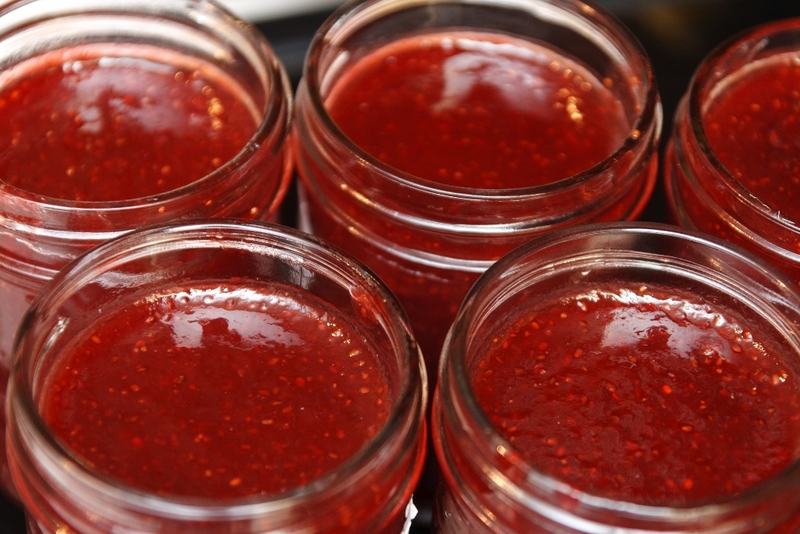 You can check the consistency of the jam by dipping a wooden spoon into it. When the jam sticks to the spoon at the consistency you want, it is ready. It will continue to thicken a bit as it cools. Then you can either fork mash the berries, or use an immersion blender if you prefer a smoother jam, like I do. See?? Super easy. I think the whole thing took me maybe 20 minutes for 5 jars of jam (plus the 5 blueberry I also made). I chose to not process this for canning, as I just don't have the time for that these days. So I just jarred it and stuffed it in the freezer to have delicious homemade jam throughout the winter. Hmmm.... not getting so far on that freezer challenge, huh??? hummm sounds and likes good!! !